Have you ever gone through the situation when you have a series of image files or Scanned documents and you have to type the text mentioned in the files? Yes, perhaps this would be your regular task of doing this annoying thing. Your fingers must be aching from typing the text constantly and the situation gets worse when you have to make a couple of changes in your image file. Probably, you do not get the accurate results. The software from the company Soft Solutions provides you the liberty from this laborious work. 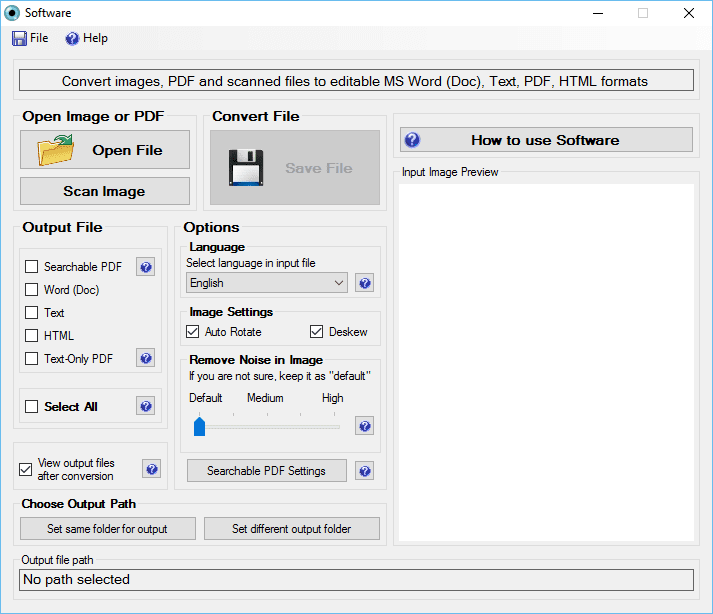 JPG to Word Converter delivers you the ingenious File conversion in the blink of an eye. It delivers the document storage and support, making better every office environment. How Does JPG to Word Converter Work? Now, choose the image file or scanned document you need to digitize. In this step, you require to select the output format which will obviously be Word (Doc). If you have to make some changes, Go to the option “Setting”. In this final step, just click the option “save” and make yourself happy seeing the converted file in your desired format. If your file is skewed and has broken characters, this software enables to edit the text in an accurate way. It can auto correct the characters of the text. Moreover, it allows adding the new information in the document. You waste your hours and effort while doing this work manually. JPG to Word Converter can do the conversion of multiple files in one go without any complication. It spares your time, which you can utilize doing another important task. When you select the software for the file conversion, it should be mandatory to get the security feature because the information of the documents can be valuable and should not disclose in any circumstances. This software provides you the password protection and watermark feature for the security reason of the document. When you are doing the file conversion, you can set the resolution according to your preferences as it supports the DPI (Dots Per Inch). You must keep one thing in mind is that the quality of your image file should be good enough, then you can get the best quality of the converted file. Another advantage of this software is, it enables to recognize the characters in more than 40 languages. If you have a document in a foreign language and you need the conversion in the exact language, this software is capable to detect the characters. You will get the result in the same language, without any error, and in the original layout.